At first the screen is black. Then, very slowly, an area of dark gray transforms itself into blinding white. This is light projected through film onto the screen, the first basic principle of the movies. The light flickers and jumps around, finally resolving itself into a crude cartoon of a fat lady. Then the pace picks up. There are shots of cops in old cars, maybe the Keystone Kops. There is a flicker of a tramp; maybe it was Chaplin. There is some footage from an old horror movie, and now there is a sound track too. We hear creepy music. Then some other shots, harder to place. All this takes several minutes, before the titles for Ingmar Bergman's "Persona" finally appear on the screen. Apparently Bergman intends his film to begin with the invention of the "moving picture" and then to work its way forward in time to the present moment. He is establishing "Persona" as a definite episode in the history of the movies. Most movies try to seduce us into forgetting we're "only" watching a movie. But Bergman keeps reminding us his story isn't "real." At a crucial moment in his plot the film seemingly breaks, and after it rips for a dozen frames it seems to catch fire within the projector. We see it melting on the screen. Then blackness, then light and then the old silent comedies again, as "Persona" starts again at the beginning. Near the end of the film, there is even a transition made by cutting from one of the actresses to a shot of the camera crew. Light men, camera operators, script girls and Bergman himself look at us dispassionately. Then the on-screen camera turns, and in its view finder we see what will be the next scene. We have been brutally reminded that the story is being filtered through technical equipment. 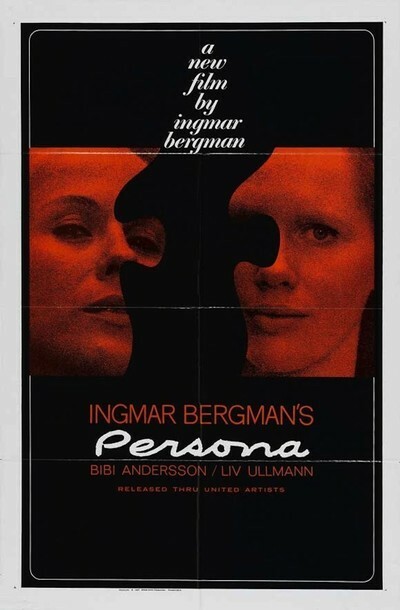 Bergman's preoccupation with illusion and reality seems to be tied into the plot of "Persona," which involves a neurotic actress (Liv Ullmann) and her nurse (Bibi Andersson). The actress stopped speaking one night in the middle of a performance and hasn't said a word since. The nurse's duty is to try to win her confidence during a summer of seclusion in the country. As the two women grow intimate, a strange exchange of personalities seems to occur. "No, no I'm not you," the nurse cries, "I'm myself." The actress doesn't reply to this or anything else, and the nurse is driven to desperate means in an attempt to get through to her. Who is she? Who is anybody? What is real? This is a difficult, frustrating film, seeming at times to have more in common with the "personal cinema" of Jean-Luc Godard than with Bergman's usual cool control. The director keeps reminding us that he's right there, creating his film before our eyes. And the distance between his presence and the story he tells is like the distance between what the actress is and what she reveals. The nurse is maddened by the unspeaking actress in the same sense that the audience is frustrated by the movie: Both stubbornly refuse to be conventional and to respond as we expect.